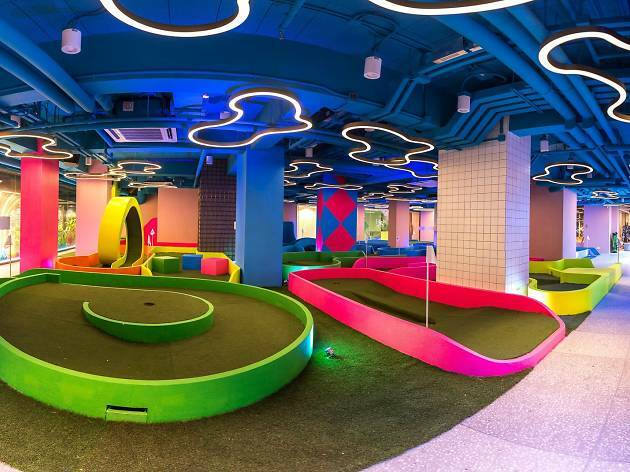 The latest addition to Causeway Bay’s array of offbeat businesses – think of the neighbourhood’s VR escape room and villain hitting ‘witches’ – is Strokes, an ‘urban golf club’ that offers mini-golf as its hook alongside food and drinks. 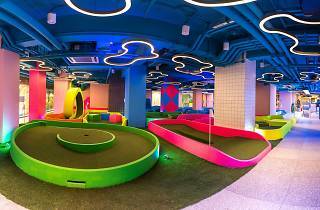 The décor is all pleasant pastel colours in the bar and restaurant area and striking neon over at the mini-golf course (currently $160 per head for nine holes, though according to staff the price is likely to get cheaper). The golf is certainly the star attraction – the loop de loop, bridges and tunnels are excellent fun to navigate, particularly if shots are at stake, and there’s a $600 nine shots package for that express purpose. The rest of the establishment is no afterthought, though.The drinks menu is a cut above the average sports bar fare – a partnership with Moonzen allows for a solid range of local craft beers and the spirits, taking whisky as an example, are more Bruichladdich than King Robert. We start with a cocktail, though, and order a Basil Margarita ($120), which features chilli infused Cimarrón Blanco tequila, basil, Dom Bénédictine and green chartreuse. The drink doesn’t look a stunner – the basil leaf floating as garnish reminds us of a bowl of pho – but it’s well balanced. There’s a pleasant chilli kick that’s couched just right, neither overpowering or non-existent, and the basil lends a slight herbal note to the finish. The food menu is surprisingly health conscious, filled with protein bowls and low carb, high fibre offerings. But we’re here for drinks, not gains, so we ask for the Southern almond milk fried chicken and waffle ($135). When it arrives, the waffles look store-bought but are enlivened by a drizzling of sweet Japanese mayonnaise. The chicken is a slightly disappointing portion but the chef manages the trick of frying the chicken crisp on the outside while keeping it moist on the inside. We finish off with an Old Smokey ($145), Mount Gay XO rum, BenRiach Curiositas 10-Year-Old Whisky, orange peel infused sugar, orange and chocolate bitters. The brandy glass is a bit of an affectation but the cocktail itself is a decent spin on an old fashioned, sweet-bitter with sufficient smokiness. Strokes isn’t going to win any bar awards or earn any Michelin stars, but that’s not what it sets out to do. It wants to be a fun place to have a night out, with reliable food and drink – and at that it succeeds. Causeway Bay MTR Station, exit D2.